The Altiplano, which means « high plains » in Spanish, is the most extensive area of high plateau on earth outside of Tibet. It is an area of inland drainage lying in the central Andes (South America), occupying parts of Chile, Argentina, Bolivia and Peru. The major area of the Altiplano is located in Bolivia. Its height averages about 3,300 meters (11,000 feet). It is dominated by the massive peaks of active volcanoes to the west. The Atacama Desert, the driest area on the whole planet, lies to the southwest of the Altiplano. In contrast at east lies the humid Amazon rainforest. The llama (Lama glama) is a camelid, a family that evolved originally in North America 40-50 million years ago. The term llama is sometimes used more broadly, to indicate any of the four closely related animals that make up the South American branch of the family Camelidae: the true llama, the vicuña, alpaca and guanaco. They were used as a system of transportation for the Incas. 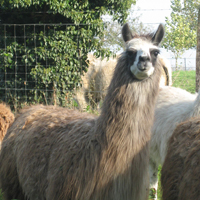 Before the Spanish invasion on the South-American continent, the llama was the only domestic animal. Used as beast of burden, it was very prized for its fur and its meat. He carried out the job of a horse, a ox and a sheep. Today, the llama mainly lives in the Altiplano, on the high plains the Andes cordillera. The llama is herbivore, which means he only eats grass and leaves (2 to 3 kg every day). The female generally lives in small group with a male. He is viviparous like most of the mammals. He can live without water and food longer than most of the others. The llama loves to spit, but it’s only to defend himself. Their life expectancy is between 15 and 20 years.